The festivities concluded with spectacular illuminations, a salvo of hundreds of fireworks, and pilot Art Smith trailing loops of flame across the sky over the Jewel City. Nearly a half million people attended Closing Day of the Panama-Pacific International Exposition—the most fairgoers recorded for a single day of the fair’s nine months. The following account was written by fair historian Laura A. Ackley and is excerpted from her book San Francisco’s Jewel City: The Panama-Pacific International Exposition of 1915 (Berkeley: Heyday/California Historical Society, 2014). San Francisco’s Jewel City is a companion publication to the California Historical Society’s exhibition City Rising: San Francisco and the 1915 World’s Fair and winner of the California Book Award, Gold Medal for Californiana. The PPIE opened with rain, and it seemed as though it would close with rain. Downpours had drenched San Francisco on December 3, and the forecast was for more showers the next day. But Closing Day dawned with a benediction instead of a baptism—summerlike blue skies and balmy temperatures. A mass of humanity, 459,022 guests, many wearing special Closing Day badges, clicked through the turnstiles to partake of the Fair’s glories one last time. PPIE president Charles C. Moore, flanked by Exposition directors, representatives from the foreign pavilions, and military men, gave the official toast sent by US president Woodrow Wilson, which was read simultaneously by officials in New York, Buenos Aires, Stockholm, Paris, Tokyo, and Melbourne. After a brief allegorical pageant, the Philippine Constabulary Band played “The Star-Spangled Banner,” a flag and wreath descended on a wire over the crowd, and a flock of doves was released. In the afternoon, a town crier in Colonial garb preceded President Moore as he made the rounds of all the exhibit palaces. At each, he met the department chief and ceremoniously lowered the Exposition flag. The Philippine Constabulary Band was one of three bands available for the entire run of the PPIE. Its bandleader, Walter H. Loving, was one of few African American military bandleaders at the time. As midnight drew nigh, the temperature stayed mild and the air still. Crowds again filled the Court of the Universe, this time to dance to Thaviu’s Band in anticipation of the final ceremonial. The Exposition Chorus sang Hallelujah, then a hush, remarkable in so large a gathering, fell as President Moore took the stage for his final proclamation. “Friends!” he began, “This is the end of a perfect day, and the beginning of an unforgettable memory.” At precisely midnight he touched a button dimming the illuminations. As the lights slowly faded, a single beam remained focused on Adolph Weinman’s graceful statue Descending Night, standing with semi-furled wings atop her column. Yet locals and visitors alike had visited with gratifying frequency. Total attendance was calculated to be 18,876,438, far exceeding the most optimistic predictions of twelve million. More than 500,000 visitors had traveled from east of the Rockies. It was estimated that more than $45 million had been injected into California’s economy from outside the state (about $2.1 billion in 2012). Approximately $12 million of this (about $565 million in 2012) was spent inside the Exposition on the Zone, in cafés, and toward purchases from Exposition exhibitors. The Fair had cost about $50 million to build, about $17.5 million of this coming from city and state coffers, and the rest from exhibitors and concessionaires. The benefits to the region and state were immeasurable and long-lasting. Some had criticized the very idea of holding the Exposition, believing San Francisco would be better served devoting all its energies to recovery while many were still suffering privations after the 1906 earthquake and fire. However, the audacity of the Jewel City’s promoters succeeded in presenting to the world a largely revived metropolis, attracting tourist and investor dollars, as well as new residents. After the cost of the Exposition Auditorium was deducted, the Fair’s profits totaled $1.31 million, about $62.7 million in 2012. . . .
Fairgoers recalled the scents of exotic flowers and fresh baked scones, the fabulous parties and banquets, lively parades, and bustling exhibit halls rumbling with the sounds of music, hawkers, and machinery. And many especially treasured the memory of the last, mild night, when the Court of the Universe was packed with a jovial mass of celebrants who together watched Art Smith trail fire across the sky from the wings of his plane, inscribing “Farewell PPIE” upon the firmament. 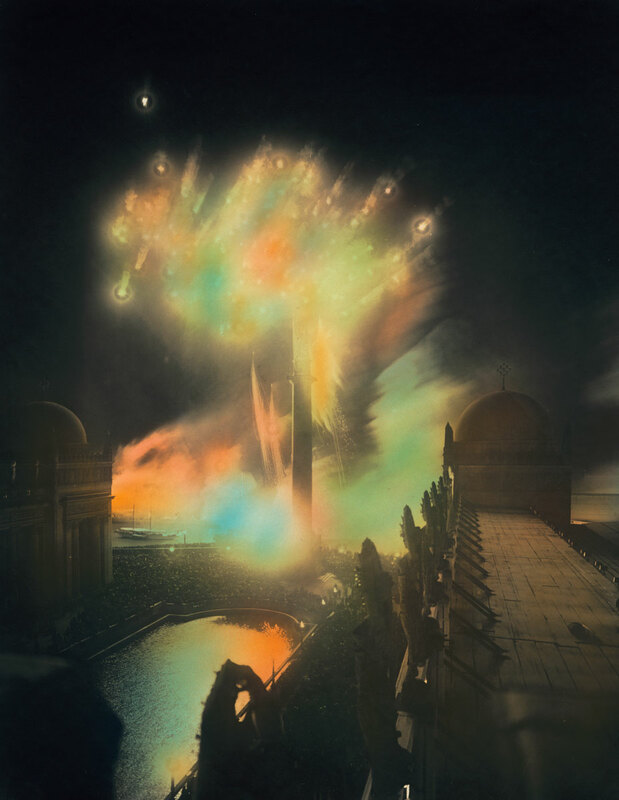 Frank Morton Todd, The Lights Go Out: An Account of the Closing Exercises of the Panama-Pacific International Exposition (San Francisco: Blair- Murdock Company, December 1915), 2. “Programme at Exposition To Be Duplicated,” San Francisco Chronicle, December 1, 1915, 11. Closing Day Program, December 4, 1915 (San Francisco: The Wahlgreen Company), 25. Fremont Wood, “‘The End of a Perfect Day’—Passing of San Francisco’s Big Fair,” American Building Association News (December 1915): 553. Wood, “‘The End of a Perfect Day,’” 551 (see ch. 19, n. 4). Laura A. Ackley holds graduate degrees from Harvard University’s Graduate School of Design and from the College of Environmental Design at the University of California, Berkeley. Her interest in the 1915 world’s fair began in an undergraduate “cultural landscapes” course at the University of California, Berkeley. Her Master of Science thesis at UC Berkeley was titled “Innovations in Illumination at the Panama-Pacific International Exposition of 1915.” A recognized authority on the PPIE, she has developed a series of popular lectures on various aspects of the Fair, and frequently delivers her commentaries before historical, arts, and civic organizations. The fair’s official closing date was December 4, 1915. To celebrate the Centennial of this event, there will be a ceremony outside the Ferry Building at 4:15 PM as the ‘1915’ lights on the building are being turned off. Learn more about this event HERE.